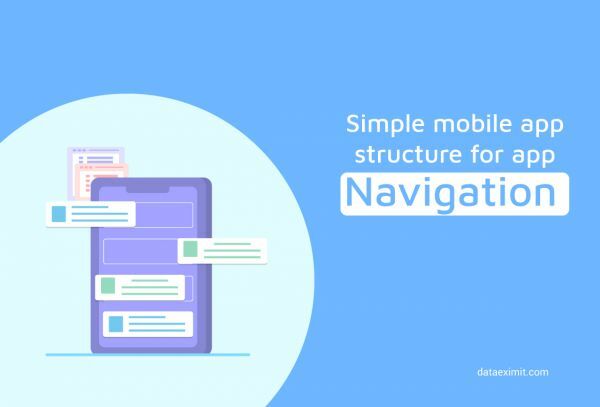 Simple mobile app structure for app navigation - Mobile app development company offers ample amount of options while choosing a mobile app structure to help comfortable user experience but you should educate yourself as well. Gesture structure for app navigation was a revolution in the mobile application industry brought forward after the introduction of touch-screen phones. Gestures based mobile application development is widely used even today after ten years as well. Gesture-based navigation structure removes unnecessary UI (User Interface) from the mobile application and makes room to showcase relevant content. Moreover, Gesture is one of the widely acceptable features for a mobile application development regardless of the language barrier. Tab navigation structure is the most simple yet most influencing navigation structure so far. Many favorite social media apps such as Twitter, Instagram, and Apple mobile application use it at best. It easily communicates with the audience through self-exploratory icons or labels and is persistent. It also provides single tap access to valuable content to the audience. Moreover, based on your user experience research, it can be placed on top of the screen or bottom of the display. The easiest for users is bottom bar structure because through single hand use; content can be accessed easily with one click. Hamburger name was made due to the features this side drawer navigation structure offers. It layers important content on top of other content. For example, Gmail box. Where the primary tab shows important emails and side drawer gives the option of seeing only promotional, social, and update email through tapping on the option. It uses screen space very effectively to be used for a shopping application development or any other app which offers multiple buying options. Moreover, this navigation structure help in creating clean and simple designs which can attract more users for the mobile application. Another famous navigation structure used by food application developers is Full-screen structure. This structure helps showcase the services with great visuals or photographs. The list of the menu with photographers hides the secondary content and maintain focus on the main content. The content can be placed using UI which is more appealing to users. The circle menu navigation structure is a fun way to express your company and its products or services. Possibly for companies with lesser products and services. It holds less content and more icons for visualization of mobile application development. The mobile app development company place the content in circles of icons which helps the user navigate to hidden content under the layers. It provides a more memorable experience and helps a mobile app standout of the competitors. From a student to multinational companies have a mobile application launched to widen their market and business all around the globe. Small business does not consider developing its web application due to competition in the market and budget constraints, but the right web app development company can provide quality web app. Today, with technology it is very easy to reach out to people through mobile apps as almost everyone uses mobile devices in their everyday life for different reasons like communication, entertainment. App Annie, a market researcher, has predicted that the mobile app development market will shoot up to $189 billion by 2020. Mobile apps are a major product of many app developers. In order to output a good product and establish consumer trust, it is important for a mobile app developer. Mobile app development has become a very big market. The use of mobile devices has continued to increase with manufacturers coming up with new products every few months. What are the common things to consider when selecting a mobile app developer? Selecting a mobile app developer is not a straightforward activity and should never be rushed because the outcome may not be favorable. Hybrid mobile app development will become more and more popular for many companies and app developers, as the platform preferences advance and higher performance systems are released.